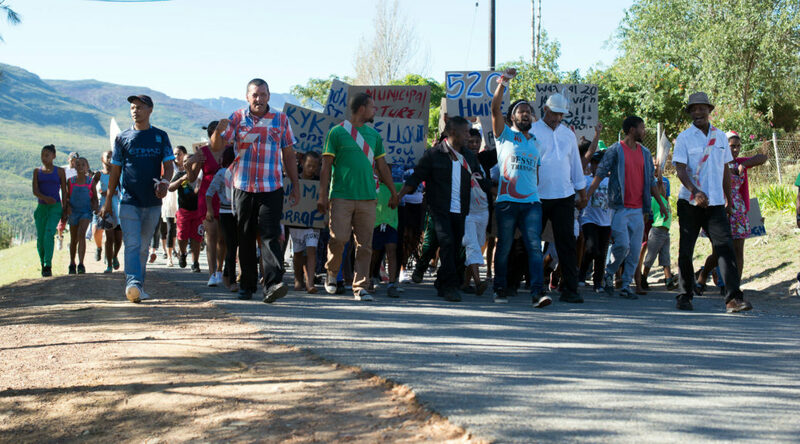 The organisers of Sunday’s protest march in Suurbraak (14 May 2017) were the SYM (Suurbraak Youth Movement chaired by Donovan Julius) and the SCA (Suurbraak Civic Association chaired by Burton Beukes). Both these organisations can feel justly proud of what they achieved. Apart from one troubling incident, about which I’ll report below, the march was efficiently managed and executed. The organisers amassed an impressive Suurbraak-style turnout comprising children, young men and women, middle aged and the elderly following in cars, bakkies and on a truck. In fact I felt quite sorry for the kids who must have been forbidden by their parents to take part and who watched the passing cavalcade with longing. Click on the window below in order to see footage of the march. After the protesters had completed their route there was a general milling around with attempts by the organisers at maintaining the focus of protesters. Whether it was spontaneous or engineered I cannot say but at one point the protesters en masse started chanting the name of a community leader with whom they seemed to be at odds. This combustible incident, which I intentionally didn’t capture on video left me troubled. This is the message which I have sent to the (Swellendam) Council (or Municipality, as in raad). OK this comes from the Suurbraak Civic Association or the abbreviation SCA, and the letter is dated 14 May 2017 and addressed to Municipal Manager, Swellendam Municipality, Swellendam, 6740. The heading is Suurbraak Community. The above organisation with the support of the overwhelming majority of the resident of Suurbraak requests you within 14 days to investigate the demands of our community and to respond in writing or verbally within 14 days. What follow are the images of Sunday’s protest arranged into three categories. This report forms part of a series that documents the rolling mass action in Suurbraak and attempts to understand the causes and should be read in conjunction with: Suurbraak rolling mass action: a commentary. report on the protest (Sunday 7 May 2017) (analyses the causes within its historical context and asks the question is what is happening in Suurbraak a sign of what might be happening in the country as a whole). My intention in covering these protests is to see things as they are. Please, therefore, suggest corrections or alternative interpretations in the comment box.